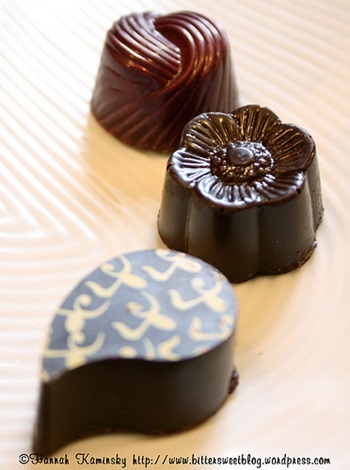 Although Xan Confections isn’t a purely dairy-free chocolatier, they do craft a couple lines of all-vegan chocolates. The Jewel Collection offers a big assortment of dairy-free caramel flavors, while the Saintly Sins is a fruity, low-glycemic line. Both offer gift-worthy appeal and hit the sweet spot for unique chocolate cravings. Hannah of Bittersweet shared her thoughts and photos for several of the Xan Confections Vegan Chocolates with us. These molded chocolates are absolutely stunning eye candy. 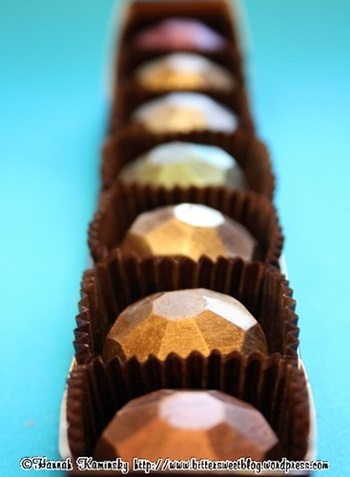 The aptly named Jewel Collection consists of colorful, shimmering chocolate shells enclosing a variety of flavored caramels. Each flavor is accented by a different lovely hue. What a shock to discover a spicy, cayenne-flecked, flowing caramel sequestered inside that unassuming chocolate casing of the Ancho Chili Caramel! This one really made me sit up and take notice. It was a real wake up call, with potency that rivaled a cup of coffee! The Raspberry Caramel had a bright, fresh raspberry flavor, just like homemade raspberry jam, that leapt out from within the pink-dusted chocolate. The Butterscotch Caramel had a pure caramel core with the perfect hit of salt. It truly made my tongue sing. Although, simple, it still had me swooning. The Chocolate Caramel variety had an unexpectedly firm ganache center. It was a delicious surprise to bite into. It had an incredible richness and intense chocolate flavor. The Saintly Sins collection packs the same punch of flavor and sublime texture, but is light in both fat and calories. I had trouble believing it myself as I bit through the perfectly tempered chocolate pieces that broke off with a satisfying snap. Although the filling was runny to the point of being syrupy, the fruity flavors were fresh and intense. With the gently bitter chocolate exteriors, they made a perfect pair. It’s hard to find vegan chocolates of this quality. 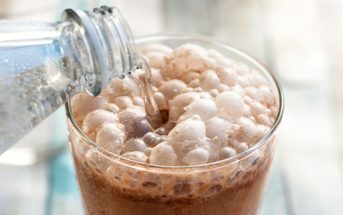 So if you’re craving a truly satisfying fix, it’s well worth the hazards of ordering Xan Confections through the internet, even in the hottest of months! Certifications: We were unable to find any certifications for Xan Confections Vegan Chocolates. 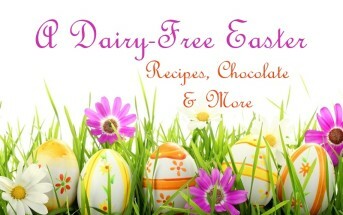 Dietary Notes: By ingredients, Xan Confections Vegan Chocolates are dairy-free / non-dairy, egg-free, gluten-free, peanut-free, vegan / plant-based, vegetarian. Some varieties are made without nuts and/or soy. Nonetheless, always read the ingredient statement and check with the company on their manufacturing processes for all varieties if potential allergen cross-contamination is an issue for you. Processes and labeling are subject to change at any time for any company / product. For More Product Information: Visit the Xan Confections website at xanconfections.com. Seen these beautiful chocolate jewels on food network, And thought just have to try these. How do I order? Head to their website Carol! We’ve linked to it in the post above.